Gathering information to support a crisis or a cause with confidence? When a crisis occurs in your community, across the state, or the other side of the world, we often have an immediate and heartfelt desire to get out there and help in some way. Logistically, volunteering at “ground zero” is not often possible. Traveling to a location overwrought by natural or human-made disaster is often unlawful and usually unsafe. When you want to make a difference and reach out to those in need, how can you help? What should you do? What charity is best for this cause? Logistically, volunteering at “ground zero” is not often possible. Traveling to a location overwrought by natural or human-made disaster is often unlawful and usually unsafe. When you want to make a difference and reach out to those in need, how can you help? What should you do? What charity is best for this cause? What charity is providing the most proceeds to those in need? Is this charity the safe choice? Do they accept money or item donations? Will those who are affected by the crisis need money or supplies? Your Employer – This a common way to give back. 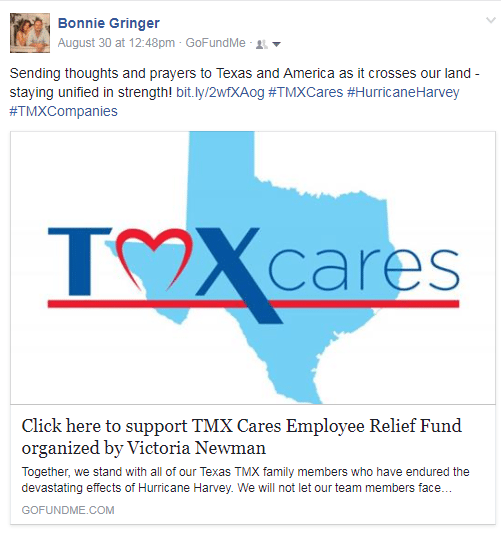 For example, TMX Finance Family of Companies through #TMXCares, a company-wide fund raising initiative, supports various causes such as a Back to School Drive in cooperation with a local organization, SAFE Shelter, and recently to those who work and live in the areas affected by Hurricane Harvey. If online fundraising is not your thing or you like a more personal approach, what about rallying up your neighbors for a bake sale, chili cook off, or community yard sale? Are there any skills amongst the group such as a registered stylist to donate manicures to raise funds? Host an event and sell tickets such as an ice cream social, Bingo, or Kid’s Carnival. If you have the time and want to donate hands on support, then take the troops to the local shelter, hospice, food bank and lend a hand! Matthew Ministries is distributing personal care kits, cleaning products, first aid and safety kits, diapers, paper goods and tarps.